The College of Liberal Arts is central to the intellectual and artistic life of the University of Nevada, Reno. We contribute to the university’s efforts to provide undergraduate students with general and specialized education that will prepare them for advanced study, careers and citizenship in a diverse world. The college offers a wide range of undergraduate and graduate degrees and supports major scholarly research and creative activity in the humanities, arts, and social sciences. The quality and effectiveness of the college’s programs are crucial to the success of the university. The college provides students with the knowledge, communicative and critical thinking skills, and creative experience they need in order to navigate in a complex global environment. Faculty members teach courses in their field of expertise, play an active role in the Core Curriculum, and create new courses in response to social changes and disciplinary developments. They bring artistic innovation to campus and the latest scholarship into the classroom. The college offers undergraduates rigorous, innovative programs of study in their chosen majors and minors. Our faculty teaches graduate students to do original scholarly research or creative work. We mentor undergraduate and graduate students as they launch successful professional careers. The college supports discovery, creativity, and the advancement of knowledge. Our faculty is composed of active, engaged scholars and artists who present their research and creative work in major venues, from respected journals to prominent exhibition and performance spaces. Many publish with leading scholarly presses; many compete nationally for grant funding to support specialized research programs. Our faculty promotes creative and research opportunities for students, working with them closely on senior projects, recitals, theses, and dissertations. The college supports the scholarly and creative work of its faculty and students. We value rigor and vitality in the disciplines and in interdisciplinary scholarship, recognizing that truly innovative work often changes how we view our own and other fields of knowledge. The college provides service and outreach on many levels. Faculty members devote considerable time to service at the university, from advising students to administering programs and contributing to university governance. They play a significant role in their disciplines, providing external review of new scholarly and creative work and serving on editorial boards and in national organizations. Many serve as well in the community or involve students in community service. Our students have become leaders in economic, cultural, and political life. Both faculty and students donate their time and professional expertise to the region, state, nation, and world. The School of the Arts combines the departments of Art, Music, and Theatre and Dance into one administrative unit within the College of Liberal Arts. Its degree programs provide strong foundations in a range of artistic disciplines, enabling students to contribute as artists, educators, and scholars on the local level and beyond. To that end, the school offers undergraduate and graduate degrees in art (BA, BFA, MFA), music (BA, BM, MA, MM), music education (BM, MM), theatre (BA), and a minor in dance. In addition to its curricular offerings, the school embraces its role as a vibrant center for arts and culture. It encourages broad community and campus participation in the arts through its numerous performances, lectures, shows, core courses, and outreach activities that explore diverse cultures and encourage lifelong learning. Finally, the school also supports and encourages research, innovation, and the artistic endeavors of its faculty. Program and event locations: the Church Fine Arts Building houses the Nightingale Concert Hall; Redfield Proscenium and Studio theatres; the Sheppard, McNamara, Front Door, and Exit galleries; and classrooms and offices for art, dance, music, and theatre. Dance studios and classrooms are located in the Lombardi Recreation Center; music and dance offices in the Virginia Street Gymnasium. The Jot Travis Building houses the Black Rock Press and art studios and classrooms. The Gender, Race, and Identity Program (GRI) located within the College of Liberal Arts, brings together the undergraduate major and minor in Women’s Studies, the M.A. in Gender, Race, and Identity, the Graduate Certificate in Gender, Race, and Identity, and the minors in Ethnic Studies (ETS), Holocaust, Genocide, and Peace Studies (HGPS), and Religious Studies (RST) to provide an academically effective and comprehensive program for diversity. The academic majors and minors integrated within Gender, Race, and Identity share a focus on people at the margins and analyze the experience of difference and oppression in its various forms on individuals and societies. Because the academic mission and curricular requirements, philosophies, and historical and social perspectives of the programs included in GRI draw from the same impulse, their incorporation into a shared program provides an academically sound and philosophically coherent mission. Detailed descriptions of the programs housed within GRI are included in the alphabetical listing in the College of Liberal Arts programs. The School of Social Research and Justice Studies combines the departments of Sociology, Criminal Justice and Communication Studies with the Grant Sawyer Center for Justice Studies in one administrative unit reporting to the dean of the College of Liberal Arts. A student may earn a bachelor’s or master’s degree in Sociology and Criminal Justice and a bachelor’s degree in Communication Studies within respective departments. The Judicial Studies program, which operates under the Grant Sawyer Center for Justice Studies, offers a master’s and doctorate degree for judges, currently sitting on the bench and who possess an ABA accredited law school degree, and a master’s degree in Justice Management for those serving in or are interested in studying the justice system. The Judicial Studies programs are offered in conjunction with the National Judicial College and the National Council of Juvenile and Family Court Judges, which are located on the University of Nevada, Reno campus. Detailed descriptions of the Judicial Studies programs are included in the alphabetical listing of the Interdisciplinary chapter in this catalog. The School of Social Research and Justice Studies is designed to foster research in justice systems and social justice, areas of expertise for researchers within its three units. Bringing together these scholars, along with other faculty who have a common interest in justice issues, the school aims at interdisciplinary research and increased grant activity. Through the school’s efforts, undergraduate and graduate students stand to gain valuable experience doing research as an integral part of their studies. The College of Liberal Arts offers students the knowledge and discipline gained from a study of the humanities, social sciences, and fine arts. Students are encouraged to think critically, develop intellectual curiosity and communicate effectively. Degree requirements are designed to assure a well-balanced curriculum while also allowing students freedom in selecting individual courses. The University Core Curriculum and other college requirements provide the foundation for the undergraduate student’s education in social sciences, fine arts, and humanities. Major and minor programs guide students to a greater understanding in their field of study, help students to acquire the knowledge necessary for entry into advanced study at the graduate or professional level, and prepare students for meeting their professional goals. Students must choose a major degree program, and, if required, must also complete a minor field of study. Students may also choose to seek a dual degree or a dual major. All students in the College of Liberal Arts seeking a bachelor’s degree must successfully complete the college’s general requirements. The completion of approved majors and minors is recorded on the student’s permanent university record at the time of graduation. The College of Liberal Arts offers undergraduate degrees in each department except military science. Specific requirements for each major may be found under the appropriate department in this catalog. Most majors require a minor in a different area, others are expanded and do not require a minor. A multiple degree is earned if a student wishes to major in multiple programs leading to different degrees–for example, one major leading to a Bachelor of Arts degree and another major leading to a Bachelor of Science degree. Students who earn multiple degrees with at least one major under the College of Liberal Arts are required to fulfill all of the college’s general requirements for a bachelor’s degree except that a minor is optional. A multiple major is earned if a student wishes to major in multiple programs leading to the same degree name–for example, majors leading to a Bachelor of Arts degree. Students who earn a multiple major with at least one major under the College of Liberal Arts are required to fulfill all of the college’s general requirements for a bachelor’s degree except that a minor in a third area is optional. College of Liberal Arts Student Center, Thompson Hall, 101. All required signatures must be secured on the form before it will be reviewed by Admissions and Records. 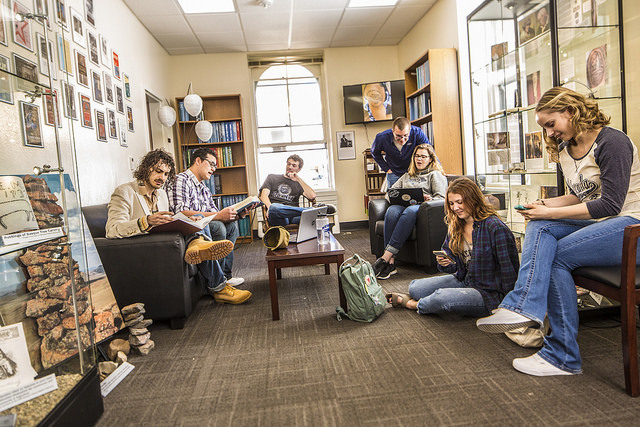 Students may not take a minor in the same department as their major, except in Anthropology, Art, English, World Languages and Literatures and Theatre and Dance. Students may choose a minor outside the College of Liberal Arts. Specific requirements for each minor may be found under the appropriate department or program in this catalog. For a complete list of minors offered by the College of Liberal Arts please visit https://www.unr.edu/degrees. Students may petition to the dean’s office to have a special related field substitute for a required minor. An approved special related field will substitute for a required minor, but it will not be recorded as a minor on the student’s official university transcript. A special related field requires a minimum of 18 credits, 9 must be upper-division, 9 must be completed at Nevada, no more than 3 credits may overlap with other requirements, 2.0 GPA in coursework, coursework may not be more than ten years old, and petition must be approved prior to a student earning 90 credits. Earn a minimum of 120 credits at the baccalaureate level, at least 42 credits of which must be numbered 300 or above. (Two additional university credit requirements are that at least 60 credits must be earned from regionally accredited, four-year educational institutions and that 30 upper-division credits must be earned at the University of Nevada, Reno in residency. Students should review the General Course Catalog online. Current students may access their degree requirements in MyNEVADA. Complete all University Core Curriculum requirements. participate in a Studies Abroad program pre-approved by the college to meet the foreign language requirement. College Breadth Requirement: Students seeking a Bachelor of Arts degree in the college shall be required to take, within the College of Liberal Arts, 6 credits that are outside the departments in which they major or minor, and that exclude courses taken to fulfill the Silver Core General Education requirements (Core Objectives 1 through 7). Complete all major and minor requirements for the degree program. Specific requirements for each major and minor may be found under the appropriate department in this catalog. Although in some cases departmental rules may allow the same course to be used to meet the requirements of both a major and a minor, no more than nine credits counted toward any major may be utilized to meet the requirements of any College of Liberal Arts minor. Complete any remaining elective credits necessary to meet minimum credit requirements. The elective course credits may be taken from any department at the university. Each department in the College of Liberal Arts does its own advising, and students should directly contact their department to be assigned an academic advisor and to make an advising appointment. Department phone numbers are listed in each individual departmental section in this catalog. These phone numbers and a list of current academic advisors are also available at https://www.unr.edu/liberal-arts/student-resources/academic-advising. Candidates for graduation must submit an application for graduation in MyNEVADA by October 1st for Fall; March 1st for Spring; and June 1st for Summer. Only Admissions and Records can certify that a student has officially met all graduation requirements. Except as otherwise specified, all students must maintain the following academic standards in order to receive a bachelor’s degree from the College of Liberal Arts. In addition to the university’s graduation requirement that students have a grade point average (GPA) of at least 2.0, the College of Liberal Arts requires that students earn a GPA of at least 2.0 in both their major and minor fields. Some college departments have higher GPA requirements for their degree programs. Refer to the appropriate department in this catalog for more information. The college’s policy for courses graded satisfactory/unsatisfactory (S/U) conforms to the university policy, except that courses taken for S/U credit do not count toward fulfilling the Prescribed Courses for Liberal Arts majors or for fulfilling major and minor requirements. This restriction on major and minor requirements can be waived if the course is recommended by the student’s academic advisor; the advisor’s recommendation must be approved by the department chair and submitted to the dean’s office for final approval. If a course is offered for S/U credit only, the college’s restrictions are waived. Students must have a cumulative grade-point average of 2.0 or higher in courses at the bachelor’s degree level to transfer into a degree program (major or minor) in the College of Liberal Arts. Some college departments have higher GPA requirements for acceptance. These requirements do not apply to new freshman applicants. University Initiated Academic Probation or Dismissal: Undergraduate students in the College of Liberal Arts who do not make satisfactory progress toward their degree may be placed on academic probation or dismissal as defined in the Undergraduate Academic Standards section in this catalog. A student placed on academic probation or dismissal is automatically considered to be on academic probation or dismissal within the college. The same policies which govern academic probation or dismissal for the university apply in the college. Department Initiated Probation or Dismissal: A student in a program within the college may also be placed on program probation for the major or minor if the GPA for the major or minor falls below the minimum requirements of the college or the department. A student who is deficient by more than 15 or more cumulative grade points relative to the GPA requirements for the major or minor can additionally be placed on program dismissal. Program probation or dismissal may be initiated by the department at the end of any semester. Students that are dismissed due to probation may appeal through the dean’s office. Release from Program Probation: A student is considered to be released from program probation once the above noted program conditions have been remedied. Readmission after Program Dismissal: The college follows the university’s policies for readmission to a program after dismissal. Students should contact the dean’s office for further information. Most law schools do not recommend a specific undergraduate major for prospective law students. A broad general education with emphasis on courses that develop clear and systematic thinking is the best preparation for the study of law. Pre-law students are advised to develop their command of the English language and their ability to communicate ideas clearly, logically, and critically. For more detailed discussion of the recommended general education program, students should read the catalogs of law schools in which they are interested. In the College of Liberal Arts, the Criminal Justice department offers an interdisciplinary pre-law major. The Philosophy Department offers a major and a minor in Ethics, Law, and Politics. A prescribed pre-legal course of study is also available in the department of Political Science. For more information you may contact pre-legal advisors in the departments of Criminal Justice (775-784-4701), Political Science (775-784-4601), or Philosophy (775-784-6846). The College of Liberal Arts houses and/or participates in several interdisciplinary programs. The following programs are listed in that chapter of this catalog: Asian Studies, minor; Basque Studies, Ph.D. and minor; Historic Preservation, minor; Japanese Studies, minor; Judicial Studies, M.A. (open to sitting judges only), Justice Management, M.A. ; Latin American Studies, minor; Medieval and Renaissance Studies, minor; Museum Studies, minor; Neuroscience, B.S., M.A., and Ph.D.; and the Social Psychology Ph.D. Please see the College of Interdisciplinary Programs and Interdisciplinary Programs section for more information on these programs.